A lightweight and extremely flexible and efficient storage of your valuable documents in any kind of file format, FCR 25 from Fichet-Bauche is tested and certified for up to one hour fire protection. A fire can have irreversible impact on your company business if your important documents are not protected with proper certified fire-resistant filing cabinets. For your valuable and confidential documents, you need the most popular fire-tested solution that is approved according to the international standards. But you also want to take full advantage of the storage capacity with an easy-to-use cabinet that can integrate perfectly into your office interior. 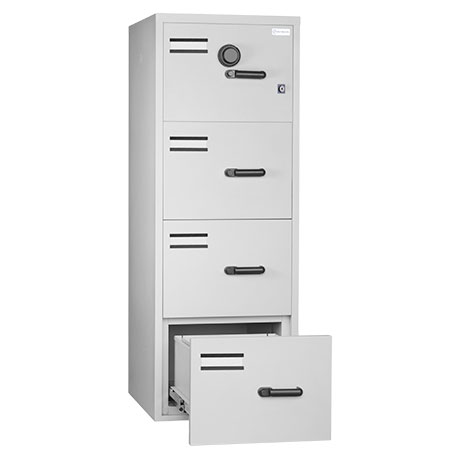 FCR 25 from Fichet-Bauche is a range of filing cabinets that provide fire protection for up to one hour certified by UL (Underwriter’s Laboratories) according to Standard 72 Class 350 without compromising on storage capacity. Thanks to high-quality insulation material between each drawer, your content inside each drawer is independently protected from fire and dust. And with the interlocking system, you can prevent from more than one drawer being open at once.